Tim Palmer wrote the book on California rivers. Here are his 8 favorite spots. Tim Palmer loves rivers so much that he lived out out of a van for 22 years so he could be near them. They’ve also been profoundly changed over time, with once-mighty waterways drastically reduced by damming and diversions. Just one major river in California remains undammed: the Smith on the North Coast. Palmer said that even as California has largely moved past the era of big-dam building and egregious municipal pollution, the fate of the state’s rivers will be shaped by ongoing battles over environmental protections and climate change. We asked Palmer to share his favorite stretches of California rivers, along with some of his pictures. Below are descriptions of the eight places he chose, in his own words. The Tuolumne plunges from Yosemite National Park, then drops through a premier whitewater rafting run, and finally cuts across rugged foothills and California's Central Valley. While the damming of the upper river at Hetch Hetchy Valley flooded the only landscape similar to Yosemite, and while the lower river is heavily diverted for irrigation, splendid wild sections remain. 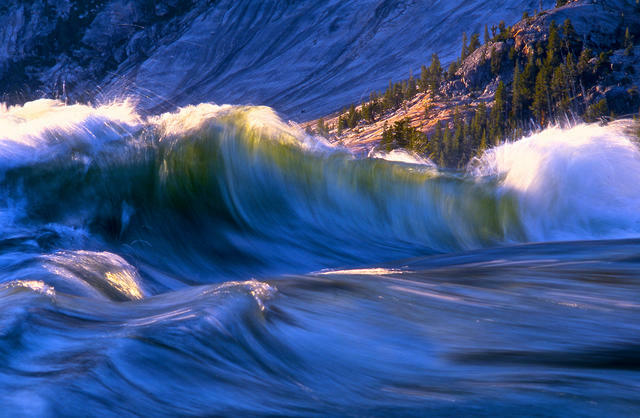 In this photo a six-foot-tall wave swells at the brink of Glen Aulin Falls, reached by hiking six miles downriver from the Lembert Dome parking area in Yosemite's Tuolumne Meadows. I regard this as America's most exceptional hike through a mountain canyon with waterfalls. At high flows in June the explosive whitewater and chain of breathtaking cataracts create the most vivid hydrologic phenomenon one is ever likely to see. The American River flows from the Sierra Nevada to its confluence with the Sacramento River in the Sacramento Valley. The American in Sacramento is California's quintessential river, central to the state's geography and history, the waterway of the capital, and one of the most-used urban recreational streams anywhere. Above, the South Fork offers some of the busiest whitewater in the nation. Then, for 23 miles below Folsom Dam gentler flows of the main stem draw city residents to swim, fish, paddle, hike, and simply sit. Here, an angler heads home at sunset about a block from Sacramento State University. The Merced River is known for its steep course through Yosemite National Park. The Merced is Yosemite National Park's centerpiece, sourced in some of the nation's most spectacular high country, careening over high waterfalls, winding through an elegant valley, and continuing into a less-known but equally stunning lower canyon that penetrates the Sierra foothills before pooling into reservoirs and winding through farmlands. Though its upper 61 miles were designated by Congress for protection against further damming, it’s now threatened by an irrigation district's proposal to remove safeguards in the lower canyon in order to raise a dam for a small amount of additional water storage. 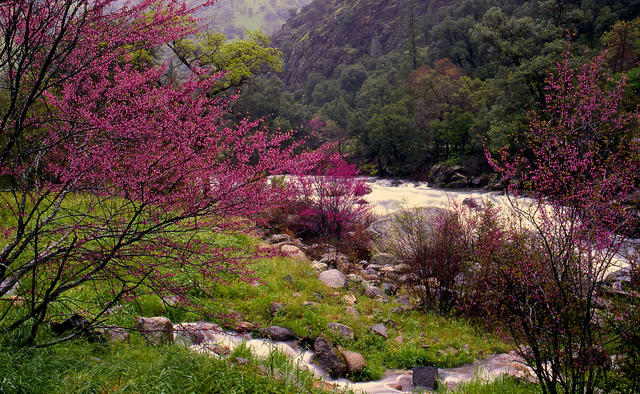 Highway 140 and back roads downstream from El Portal lead to whitewater rapids and picturesque scenes like these redbuds blooming in springtime. Malibu Creek flows through the Santa Monica Mountains on its way to Santa Monica Bay. Southern California lacks the rainfall and snowmelt that create the north's legendary fish-and forest-rich riverlands, but some streams still carry runoff from coastal mountains to sea. 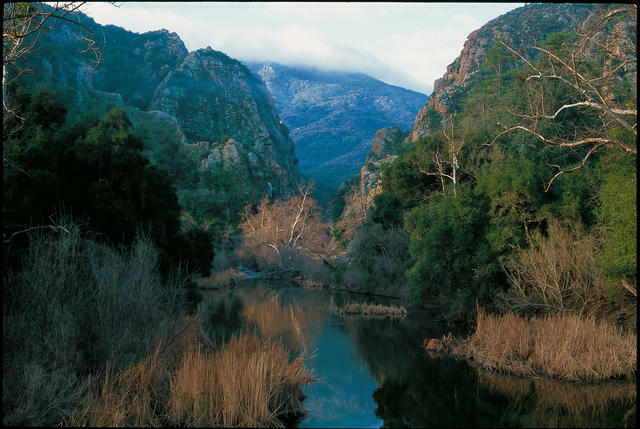 Just outside Los Angeles, Malibu Creek sculpts a canyon through the Santa Monica Mountains for nine miles within Malibu Creek State Park. Trails, swimming holes, and the shade of sycamores delight millions seeking a nature fix at the edge of one of the nation's largest urban areas. Malibu also nourishes one of California's southernmost steelhead runs, though the charismatic trout's upstream spawning runs are cut short by Ridge Dam, built in 1926 for a cattle ranch and now silt-filled and obsolete. The Russian River winds through Northern California's lush Wine Country. Flowing from coastal mountains and angling out to the ocean at Jenner, cool water of the Russian River appeals to swimmers and canoeists from the San Francisco Bay Area. Once-renowned salmon and steelhead runs have dwindled with dams, diversions, and development. However, restoration efforts aim to bring some of the fish back. 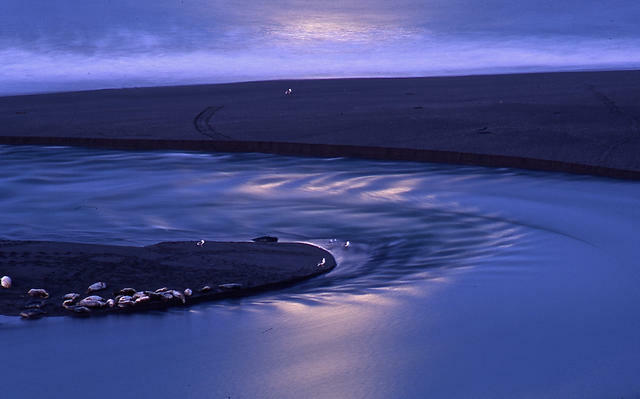 I caught this photo of seals in moonlight with a time exposure from a pull-off along Highway 1. The Russian's final melding with the Pacific can be seen at one of California's few remaining major river mouths lacking jetties, harbors, or seawalls: half a mile south of Jenner, turn west into Goat Rock Beach Regional Park and stroll to where river meets sea. 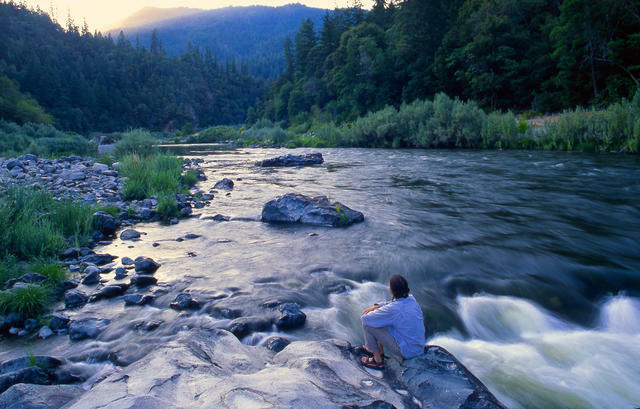 Middle Fork Feather River is a gem in the wilderness of Plumas and Butte counties. Among the wilder California rivers, the Middle Fork of the Feather forms in headwaters near Quincy and surges westward, abruptly bisecting the formidable rise of the northern Sierra Nevada. This section above Oroville Reservoir was designated in the original National Wild and Scenic Rivers Act 50 years ago. Sequestered in wilderness, this gem is difficult to reach, but can be seen at Milsap Bar for those willing to brave a steep, rough road to the only crossing in a 39-mile-long canyon. 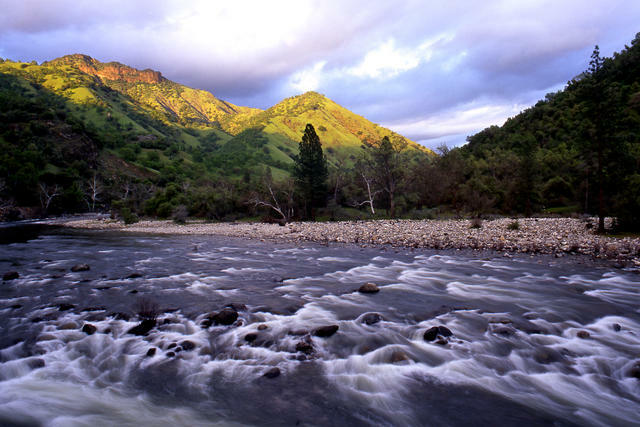 Kings River drops with the greatest undammed gradient of any river in the country. The 400-mile-long uplift of the Sierra Nevada gives rise to 17 enrapturing river systems, but the Kings occupies a class by itself. Born in snowmelt at 12,000 feet, it drops with the greatest undammed gradient of any river in America and carves the deepest canyon — far deeper than even the Grand Canyon. Below Kings Canyon National Park, and marking the boundary between two great national forests, whitewater makes for a rafting hotspot while clean, cold water supports one of the state's finest large-river trout fisheries. This photo was taken in the Kings' alluring canyon upstream from Pine Flat Reservoir when the green glow of springtime invites visitors to wander along the waterside. 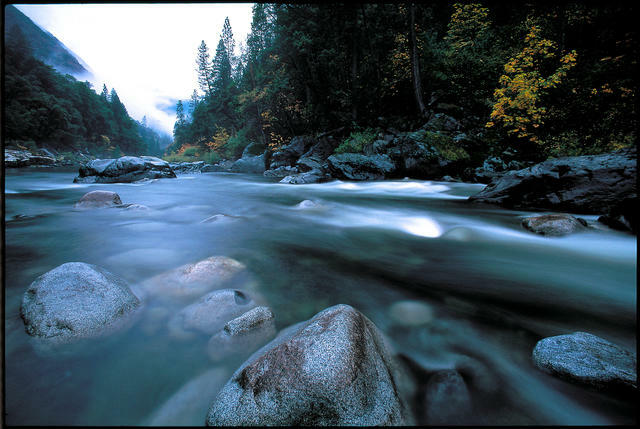 The Klamath River includes longest free-flowing stretch of river in California. The Klamath is the second largest river in California. For 193 miles downstream from a dam complex straddling the Oregon border, the river flows unchecked to the Pacific — the longest dam- and levee-free reach in the state. Its basin has less population density than Montana. Once renowned for salmon and steelhead that supported a vast commercial fishery in the ocean and sustenance lasting millennia for local tribes, the river has been diminished by reservoirs, diversions, and logging. But now the world's largest river restoration effort is slated to remove four upstream dams within the next decade, returning headwaters to the fish that once spawned there and better flows to the river below. The Klamath can be visited at many sites along Highway 96, and by kayakers and canoeists who paddle for two weeks on this northern artery with only one vehicle-aided portage around Ishi Pishi Falls. This photo shows a summer scene at the edge of the Klamath above the village of Orleans. Tim Palmer is the author and photographer of "Field Guide to California Rivers," "Rivers of California," and "Wild and Scenic Rivers: An American Legacy." 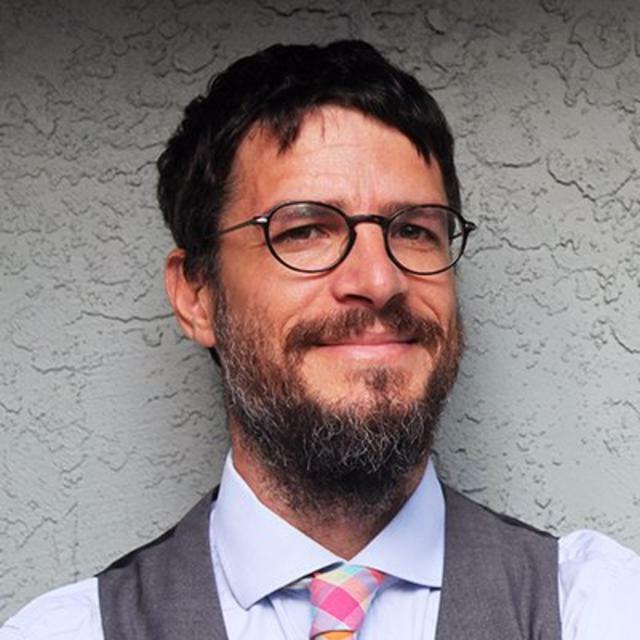 See his work at www.timpalmer.org.